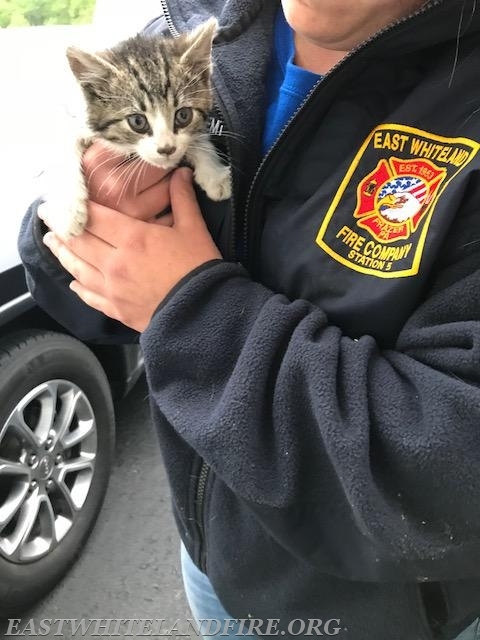 On Sunday, May 13th at approximately 6:30pm, the fire company received a call for a kitten stuck in the motor of a car on Sagewood Road in Charlestown Township. The kitten had wandered off from its mother and climbed into the engine mechanism of a car parked in a driveway. Firefighters arrived and discovered that the kitten had wedged itself above the frame and into the motor area. Firefighters were able to get the kitten out without causing any harm. Soon the kitten was reunited with it's mom. A fitting rescue for Mother's day.